Directions：For this part，you are allowed 30 minutes to write a short essay entitled Career Choice based on the statistics provided in the table below(Percentage for career choice by both boys and girls).Please give a brief description of the bar chart first and then make comments on it.You should write at least l20 words but to more than l80 words. 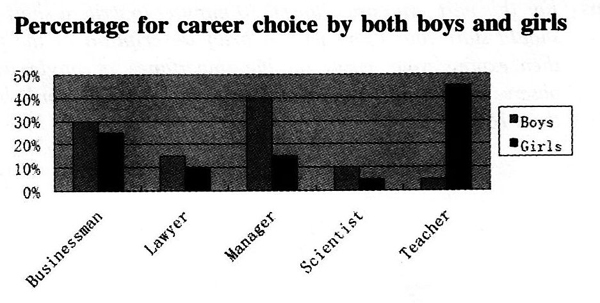 The bar chart shows that the most striking contrast in career choice by boys and girls is in teaching：45%of the girls would like to become teachers while only 5%of the boys want to do this job.The percentage of boys who like to become managers is 40%，while girls take up l5%. It informs us of the phenomenon that there exists some differences in career choice between boys and girls.The reasons accounting for this phenomenon Can be listed as follow：Quite a few boys regard being a manager as a symbol of success.as this profession stands for promising future and better pay.When it comes to girls，they are more inclined to be a teacher，because this profession features stability and respect.Therefore.it is reasonable for girls to choose teacher as their ideal career goals. To boys and girls alike，they should have a clear idea about the job that suits them the best and examine it from every angle before they make the final decision.